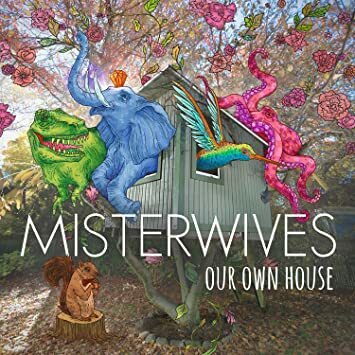 There’s a reason why MisterWives has been touted as the “next golden children in pop” by the likes of MTV’s Buzzworthy and just about anyone else who released a list of artists to listen to in 2015, and the group’s debut album Our Own House proves them all right. The New York based quintet has found a genre that they fit within perfectly, and may actually be the leaders of, if their latest release Our Own House is any indication. Opening with the title-track, it’s a full-bodied pop song filled with horns and enough highs and lows that perfectly exemplify what listeners have waiting for them in the following tracks. The culmination of the 12 songs created a perfect pop release – so perfect, in fact, we feel it is necessary to tell you to just stop reading here, purchase the album, and then continue with this review, because from here on out, we basically just talk about how much we love it. Which is a whole lot. It’s hard to choose a standout track amongst this album, which will most likely find itself on this writer’s Top 10 of 2015 list, but there is no doubt that the final minute in the track “Oceans” is the best minute to be found on the whole damn thing. Lead singer Mandy Lee Duffy’s voice shines as it explores her range, showing that she has a huge, unstoppable voice. Other important standout track mentions are “Coffins” and “Imagination Infatuation.” The former is a hauntingly beautiful ballad intertwined with a delicate violin melody that really adds another layer to the album. The latter, an upbeat track about falling for the idea of someone, will be a fan favorite as many of us can relate. With catchy hooks led by the supreme musicianship of the band and combined with Duffy’s ethereal voice, Our Own House will be, without a doubt, the perfect spring break and summer album. It’s an uplifting release that just makes you want to move without falling into the trap of monotony. It sets an impressively high bar for a first release, and it definitely will not be leaving our playlist anytime soon. Our Own House is available now.